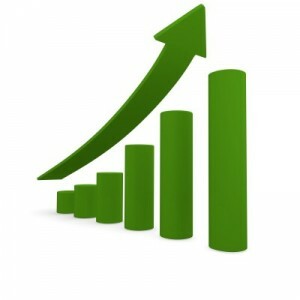 The typical U.S. household owns 2.6 Apple (AAPL) products, a 63% increase from 2012. I cannot think of any other product — especially any other product at a high price point — that has that kind of permeation with the public and level of growth. And I cannot think of a better statement as to why I’ve been wanting to get some AAPL stock for DTA’s Income Builder Portfolio. 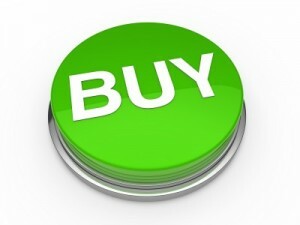 That desire became reality on Tuesday, June 26, when I executed a purchase order for 5 shares of AAPL at $182.82 each. 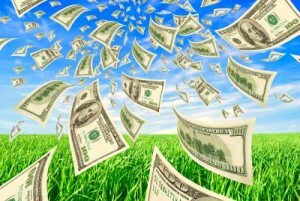 Including the $4.95 brokerage commission, the total paid was $919.05. The IBP now has an even dozen holdings, with Apple being the first from the technology sector. 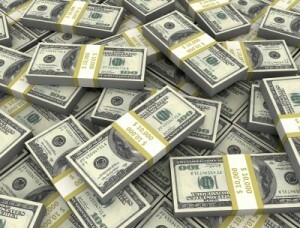 Daily Trade Alert allocates $2,000 per month to be split between two buys. 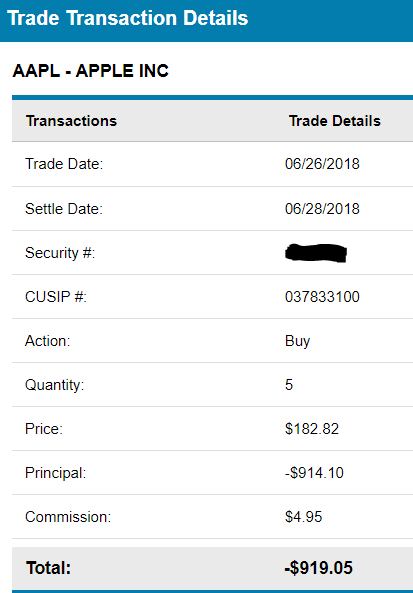 We used about $1,025 for our June 12 purchase of Starbucks (SBUX), so we didn’t have quite enough to buy a 6th share of Apple. While I would have loved to have gotten that extra share for the IBP, I’m sure we will add to the AAPL position several times over the years as we build this real-money Dividend Growth Investing portfolio. That’s an increase of 30% in just two years, which is a testament to the popularity of our products and the loyalty and satisfaction of our customers. There are not quite 1.3 billion reasons for investors to consider buying AAPL, but there sure are a lot. In my previous article, I outlined several reasons — including the appeal of the company to DGI practitioners. 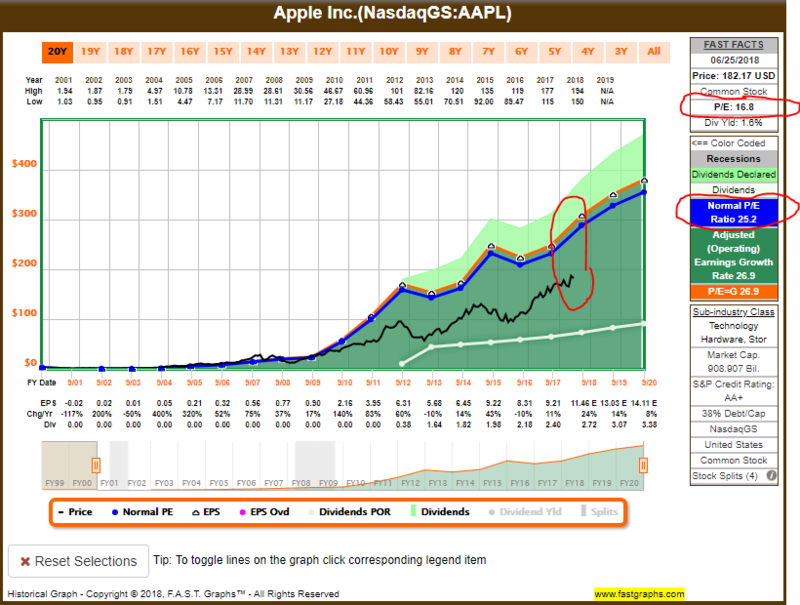 As the above table shows, AAPL’s most recent increase also was its most generous ever. Since its humble dividend beginnings, Apple has raised its payout 93% in a span of just six years. Although its yield is only 1.6%, Apple’s very low 25% payout ratio suggests a future filled with substantial hikes. Simply Safe Dividends gives the company a 96 Safety rating on a 1-to-100 scale. Come mid-August, AAPL will pay the IBP $3.65 in dividends, which will get reinvested right back into the stock, as required by the portfolio’s Business Plan. 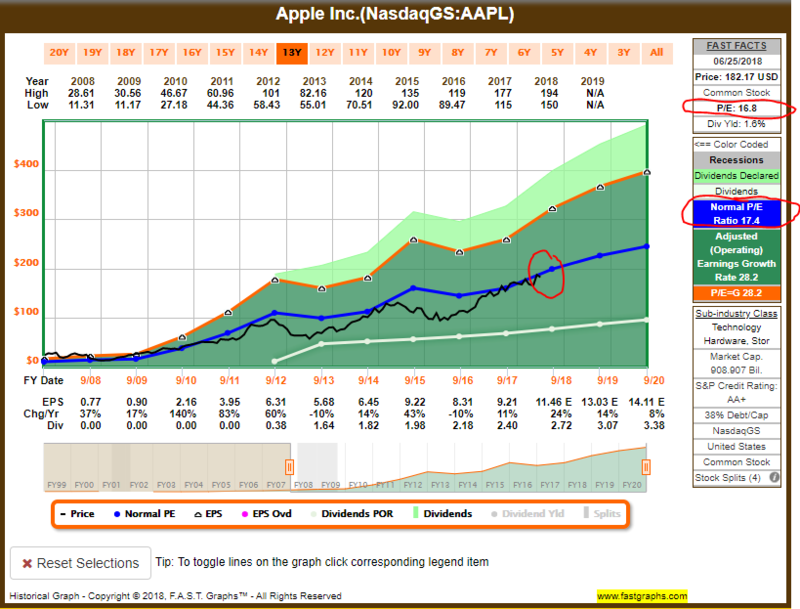 If Apple is trading at a similar price in August, the $3.65 received will buy .02 of a share. Then, three months later, the IBP would get dividends based upon the new share total of 5.02 – making the November payment $3.66. Over time, the share count will rise, as will the income produced … which is the whole idea of the Income Builder Portfolio. Many tech stocks have been seeing price declines due to Donald Trump’s threatened trade war with China and other countries. 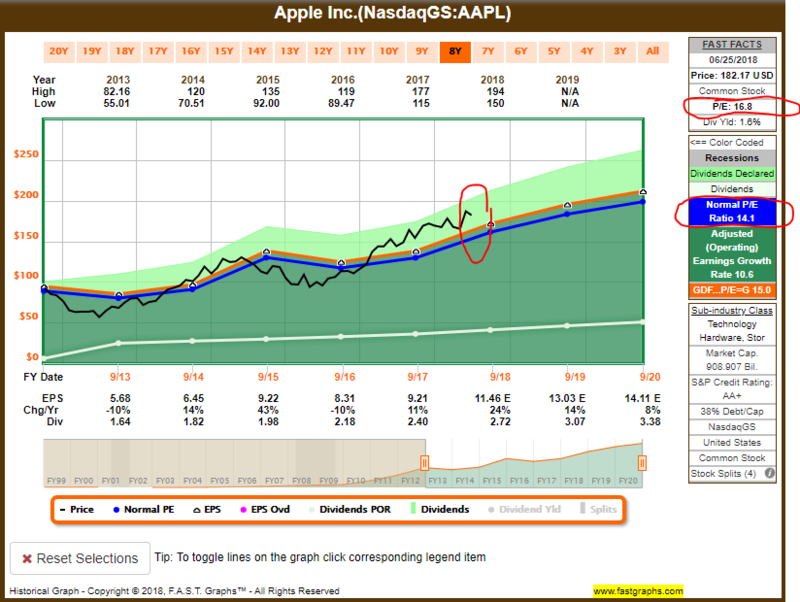 Those hoping to sell AAPL soon at the highest possible price might be unhappy. But as a ready buyer and long-term investor, I actually appreciate the better valuation metrics. Apple’s P/E ratio is higher than its recent historic average (red circled area on the Morningstar graphic below). Nonetheless, the forward P/E ratio, based upon expected 2019 earnings, is in fair-value range at 14.2 (blue circle). AAPL also has an attractive 1.1 PEG ratio (highlighted in yellow). 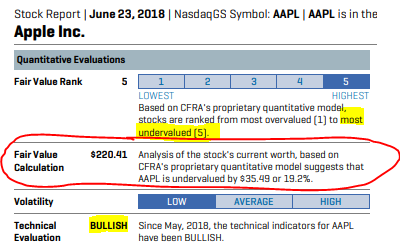 Value Line’s Relative P/E for Apple (blue circled area below) is well under 1.00, meaning the company’s P/E ratio is significantly lower than the average of the 1,700 stocks VL analyzes. FAST Graphs offers an interesting look at Apple’s valuation. The viewpoint changes depending upon the time frame used. On the illustration below, looking at the entirety of this millennium, Apple appears to be a great deal compared to its normal P/E ratio. If we shorten the time frame to just the last few years, the normal P/E ratio is 14.1 and AAPL seems quite overvalued. As an investor, I don’t rely upon fairy tales, so Goldilocks’ opinion doesn’t matter much to me. 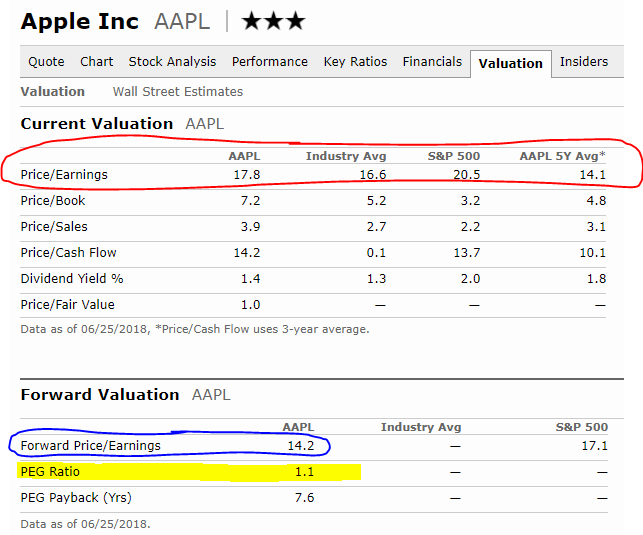 Taking all the metrics into consideration, though, I’d say AAPL looks fairly valued at worst. I could see patient investors who desire a margin of safety patiently waiting for a pullback to the $170 range, which would be a sub-15 P/E ratio based on full-year 2018 expectations. However, just as there are no guarantees that the IBP will see immediate appreciation on the price we paid, there are no assurances that AAPL will get down to $170 any time soon. My wife and I have owned only one Mac, and that is long gone. We have had Samsung phones for most of the last decade-plus. And we were among the few to choose the Dell Digital Jukebox over the iPod back in the mid-“aughts” (which is why Dell stopped making them). We nonetheless own about twice as many active Apple products as the average American household: two iPhones, including my daughter’s old 5s, which has been my mobile unit since I broke my Samsung many months ago; and three iPods from last decade that we still use. Although we like our Apple devices, we haven’t been the kind of fanatics that have spurred the company to great heights. I selected AAPL for the Income Builder Portfolio in great part because of the millions of consumers who are far more ga-ga about Apple than we have been. Those loyalists will never leave the Apple ecosystem, regardless of the premiums they have to pay for the products. As always, I urge investors to conduct their own due diligence.